This sentence spoken by the Rev. Martin Luther King Jr. has been quoted countless times as expressing one of America’s bedrock values, its language almost sounding like a constitutional amendment on equality. Yet today, 50 years after King shared this vision during his most famous speech, there is considerable disagreement about what it means. The quote is used to support opposing views on politics, affirmative action and programs intended to help the disadvantaged. Just as the words of the nation’s founders are parsed for modern meanings on guns and abortion, so are King’s words used in debates over the proper place of race in America. As we mark the King holiday, what might he ask of us in a time when both the president and a disproportionate number of people in poverty are black? Would King have wanted us to completely ignore race in a “color-blind” society? To consider race as one of many factors about a person? And how do we discern character? For at least two of King’s children, the future envisioned by the father has yet to arrive. “I don’t think we can ignore race,” says Martin Luther King III. Bernice King doubts her father would seek to ignore differences. Fifty years ago, bigotry was widely accepted. Today, Branch said, even though prejudice is widely denounced, many people unconsciously pre-judge others. Branch believes that today, King would ask people of all backgrounds — not just whites — to deepen their patriotism by leaving their comfort zones, reaching across barriers and learning about different people. “To remember that we all have to stretch ourselves to build the ties that bind a democracy, which really is the source of our strength,” Branch said. 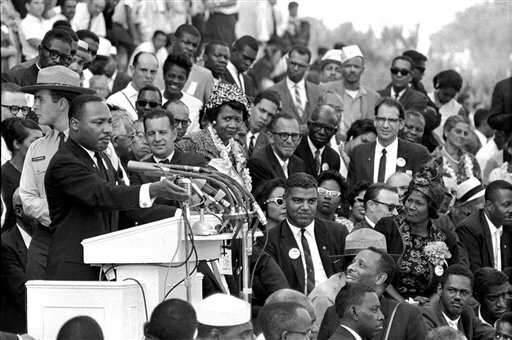 For many conservatives, the modern meaning of King’s quote is clear: Special consideration for one racial or ethnic group is a violation of the dream. The quote is like the Declaration of Independence, said Roger Clegg, president of the Center for Equal Opportunity, a conservative think tank that studies race and ethnicity. In years past, he said, America may have needed to grow into the words, but today they must be obeyed to the letter. Many others agree. King’s quote has become a staple of conservative belief that “judged by the color of their skin” includes things such as unique appeals to certain voter groups, reserving government contracts for Hispanic-owned businesses, seeking more nonwhite corporate executives, or admitting black students to college with lower test scores. Considering race as a factor in affirmative action keeps the wounds of slavery and Jim Crow “sore and festering. It encourages beneficiaries to rely on ethnicity rather than self-improvement to get ahead,” wrote the author, George Leef.